Button Cottage is located in the hamlet of Wensley in the Peak District National Park. The detached cottage is formed of workers cottages built into the hill and was converted into its current layout in the 1980s but retains original features. During renovations, buttons were discovered in the foundations which gave the cottage its name. The cottage sleeps up to six people in three well-furnished and comfortable double rooms and has two bathrooms both upstairs, a well-equipped kitchen and utility room and comfortable living / dining room and off-street parking in a garage. It is ideally suited for families or groups of friends for short breaks and longer holidays and is available all year round. It is 5 minutes from Matlock, and Bakewell, Haddon Hall and Chatsworth House within 15 minutes drive. Walks start from the front door and there are cycling trails (Monsal & Tissington Trails) close by and Carsington Water is 9 miles away. Ground floor: Living / dining room, kitchen with breakfast bar and utility room, hallway and access to garage. First floor: Bedroom 1: King-sized bed. Bedroom 2: Double bed. Bedroom 3: twin single beds. Bathroom 1: shower and toilet. Bathroom 2: bath with shower attachment and toilet. Bed linen and towels included. Outside: small terraced garden accessed via back door on the first floor with a decked area and garden furniture. Parking: One small / medium car in the garage and in front of the cottage. Facilities: Gas central heating and gas fire. Travel cot and high chair. Freeview TV with DVD player. Free BT Broadband and wi-fi. Bluetooth speaker. Gas hob, electric single oven, microwave, washer / dryer, dishwasher, fridge and freezer. A small library of books including walking and cycling guides, information on places to visit and DVDs. The nearest pub is the Stag and Hounds, in Darley Bridge which is 10 minute walk. There is a community shop in nearby Winster and Matlock has an M&S food hall, Sainsbury’s and a Co-op. Access to the first floor is via two staircases including a spiral staircase from the kitchen, there is a low height door from one side of bedroom and some uneven paving steps in the garden. Sorry, no pets and no smoking. We live in Buckinghamshire and enjoy coming to Button Cottage as often as we can with our young children. Our favourite activities are cycling on the Monsal Trail just outside Bakewell, visiting Chatsworth and walks through Dovedale but the beauty of the location is that although it is rural, there is so much to do within a short drive's distance. Close proximity to many sights and activities for all ages and tastes. Rural location but with the convenience of a small town 5 minutes away. Beautifully appointed cottage - everything there, plus extra touches - heaps of tourist info, including useful hike books, helpful basics in the fridge. Living room and other rooms spacious. Kitchen excellently equipped. Immaculate and characterful. Very comfortable beds. Owner kind and helpful too. Only quibbles - one room gets much colder at night than the others, and we found the heating control effective but difficult to use. We would definitely like to stay again. My wife and I and our three children stayed in button cottage for three nights. Geoff the owner was very good on giving information and fast at responding to my questions. The property itself was very clean and comfortable throughout with all the amenities you need. Great location to explore the Peak District and beyond. We’d definitely stay again. We thoroughly enjoyed our two night stay. The property was lovely and clean and very warm and cosy. 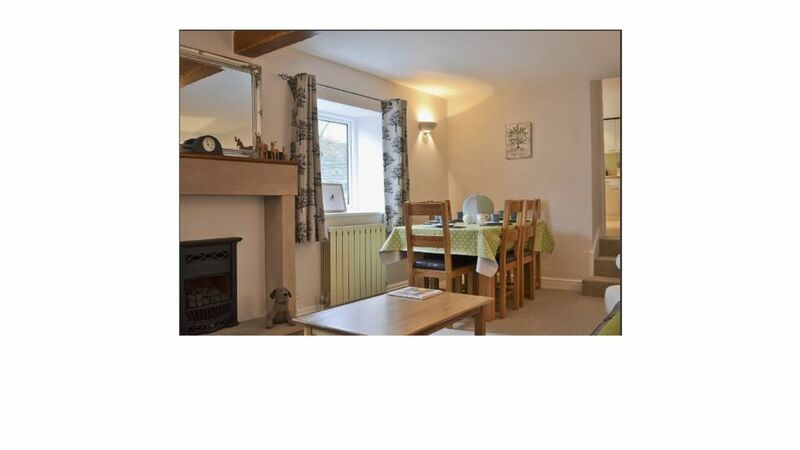 Lovely cottage in a little village close to Matlock, perfect size for a family of 6. Had a really lovely weekend and would definitely stay here again. A cozy, homely cottage that was very well equipped. Great location for exploring the Matlock & Bakewell areas, Chatsworth is always worth a bist. There was a total of 4 adults & 2 (boy/girl) children in our party & overall we found the property very comfortable & well equipped for our 3 night short break. As the weather turned quite cold it was good to have an efficient heating system to keep us warm. The cottage is well located for accessing a number of attractions in the area & is also a 5 minute car ride down to the Square & Compass pub where we received a warm welcome & some good pub grub! The cottage ground floor is on 3 levels, so OK for us, but might not suit someone with mobility difficulties. Also, it would have suited our party better if the ensuite bathroom bedroom had the double/king size bed rather than twin beds as the two children could have been located in another room thus 'freeing' the ensuite for the adults. The only negative comment we have is regarding the road through Wensley upon which the cottage is situated. As advertised, we were able to park two cars immediately outside the dwelling ( there's no footpath) & there is a free car park about 100 yards up the hill, which is a good point to turn around depending on which direction the cottage is approached. However, we were somewhat surprised on the amount & speed of traffic passing through the village, particular early morning & evenings so we made sure car mirrors were in the folded position overnight.